A general workhorse knife? SOG may have it already! The title easily sums up what the focus of this instalment of TPF will be regarding. 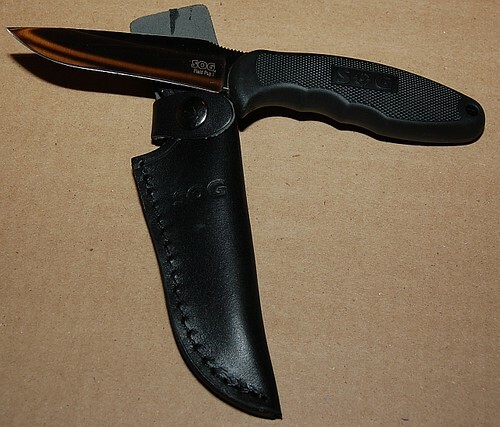 It has been called the most most popular item produced by SOG Specialty Knives and Tools. However, isn’t some fancy multi-tool, which TPF does enjoy reviewing by the way. 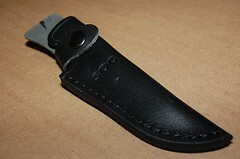 Nor is it some flashy folding knife with all sorts of carry options, which TPF also likes to see. It just happens to be a simple solidly built fixed knife titled the Field Pup I. Now here at TPF, we cannot fathom why SOG chose to label this blade the Field Pup, but when introduced in as a new product in 2002, the Field Pup was hailed as a very good all around knife. It’s larger brother the X-42 Field Knife, won in 2003 for Field and Stream’s Best of the Best for design and overall capabilities for a conventional and utilitarian blade. While the X-42 field knife is no longer produced, the Field Pup mimics most of the features that were so highly appraised on it’s bigger brother. Sporting a 102mm (4.0″) blade whose spine is an impressive 3.3mm (0.13″) thick the Field Pup shows off it’s primary feature quite well. The flat ground blade has a slight drop point profile with the back edge being nearly linear, and featuring a slight recurve cutting edge which adds to the utilitarian design of the knife itself. A recurve blade feature is supposed to lend itself to aid in slicing (draw-cuts), and on larger blades allows for more mass to be closer to the tip of the blade and promote higher chopping ability. The grip of the Field Pup is manufactured from Kraton, a synthetic substitute for rubber, and is moulded around the full length tang of the blade. With better chemical, wear, and thermal resistance than rubber, the Kraton grips are a natural choice for a field knife that could be exposed to any environment and a large variety of tasks. The thickly moulded grip incorporates a trio of shallow finger grooves and has a very slightly compressible surface which, when added to the checkered pattern on the grip sides, makes this knife extremely comfortable and affords a very secure means of holding the knife. An aggressive thumb ridging on the spine of the knife enhances the ability for imparting force and control through any heavier cutting work that may be done with the blade. Overall this knife measures 216mm (8.5″) in length and masses 212.6 grams (7.5 oz) which is fairly lightweight as an all round field utility knife. The blade is manufactured from 7Cr17MoV steel, which TPF has been told is the equivalent of 440A stainless steel, and receives very well regarded heat treatment processes, which enhance both the wear resistance and edge retaining properties of the blade. Over the many years of production, the only alterations other than the text and logo have been the once included para cord lanyard loop and a selection of sheath designs. The two previous sheath for the Field pup reflected the trends of the times. A riveted, simple leather fold-over belt sheath and a larger nylon sheath with retaining snap loop and an accessory pocket. The current sheath is a fairly simple leather fold-over design which uses 2.4 – 2.8mm (6-7 oz) leather and has the retaining edges stitched. 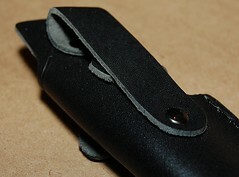 Recall that the older version was riveted, however, unlike the past version, today’s Field Pup sheath comes with a retaining snap loop. A generously sized, albeit thin, belt loop completes the sheath. A single variation of the Field Pup is available and the only difference the satin finish, as reviewed, is replaced by the blade being coated in a black titanium nitrite finish. Due to the immense popularity of this knife design, SOG also created a slightly larger version which is nearly identical in manufacture. These upscaled 121mm (4.75″) blade versions are called the Field Pup II. Overall TPF finds the Field Pup I a very solidly constructed knife and understands why it has been such a popular knife for hunters, campers, and outdoors-men in general for all these years. The Field Pup I, model FP3 as reviewed, has an MSRP of $62.25 USD and can be readily found at a variety of stores, such as Warriors and Wonders in Vancouver, B.C. The one true question that only you, the reader, can answer. Is the Field Pup I fixed blade knife, from SOG Specialty Knives and Tools; Tactical, Practical, or Fantastical? This entry was posted on October 25, 2011 by M. Duynhoven. It was filed under Blades and tools and was tagged with blade, Field Pup, fixed, FP3, knife, Kraton, recurve, SOG.